Against the glittering high-rises of the capital, Manu, a recent arrival from Nepal, drips his days away on a construction site, cut off from the world outside the labor camp. 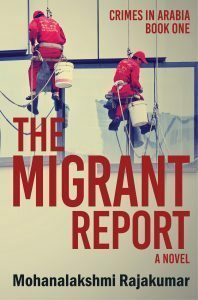 His sister despairs of finding him among the thousands of migrant workers flooding into the Arabian Gulf to build the country’s infrastructure. Manu and Sanjana must keep their younger siblings out of poverty, even if at their own expense. Police captain Ali’s hopes of joining the elite government forces are dashed when his childhood deformity is discovered. His demotion brings him face to face with a rising pile of unexplained dead bodies and also an aspiring journalist who is unlike any local girl Ali knows. In danger of flunking out of university, Maryam is searching for an original story that will appease her professor and keep her family’s machinations for marriage in check. Can the unlikely trio fit the pieces of the puzzle together before agency thugs get to Manu?